LG today announced the K Series, a new range of smartphones that prioritizes advanced photography features. The first two phones in the K Series are the K10 and K7. They offer LG photo tools such as Gesture Shot, Gesture Interval Shot, and Tap and Shot, as well as front-facing flashes for self portraits. The phones introduce new design language LG calls "glossy pebble" in order to attract younger users. The glass panels use what LG terms 2.5D Arc Glass to provide a smooth seam where the glass meets the side edge of the phone. Like many other LG handsets, the side edges are free of buttons, which are placed on the rear panel. K10: The larger of the two new K Series handsets has a 5.3-inch high-definition screen, with a 13-megapixel rear camera and 8-megapixel front camera. The processor will vary by market, but the main LTE variant has a 1.2 GHz quad-core engine under the hood with 2 GB of RAM and 16 GB of storage. It boasts a 2,300mAh battery. K7: The K7 has a 5-inch FWVGA screen, with an 8-megapixel rear camera and 5-megapixel front camera. The LTE variant has a 1.1 GHz quad-core processor with 1.5 GB of RAM and 16 GB of storage. The battery measures 2,125mAh. The K10 and K7 both run Android 5.1 Lollipop and come in several different colors. LG hasn't said if or when the K10 and K7 will be sold in the U.S.
LG introduced two mid-range phones today as part of its new K Series. The K7, which is the smaller of the two phones, will be sold in the U.S.
LG's latest low-cost smartphone for Boost Mobile is the Tribute 5. The phone competes in a crowded roster of similarly-priced handsets in Boost's lineup and struggles to stand out from the crowd. 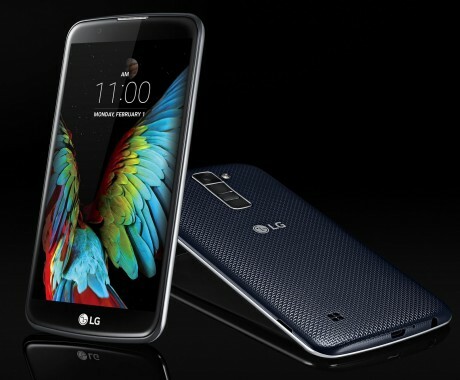 AT&T today said it plans to launch the low-cost LG K10 on July 22. The K10, announced earlier this year, features rear-mounted volume controls and home screen button. T-Mobile today made the LG K7 available for sale from its web site. The phone, announced last month, has a 5-inch screen, quad-core Snapdragon 210 processor, 5-megapixel main camera, 5-megapixel selfie camera, and LTE 4G.